Admittedly, when I first saw this flavor combo, I was doubtful. Mostly because I’m not used to using dates in a savory fashion. Date Nut Bread – yes. Sticky Toffee Pudding – oh yes. But Cauliflower – ummm, I would just have to see. It wasn’t that long ago that I posted Bacon Wrapped Stuffed Dates (oh why didn’t I try that before – all those wasted years!) so maybe I was “primed” to go one step further. I’m glad I did. 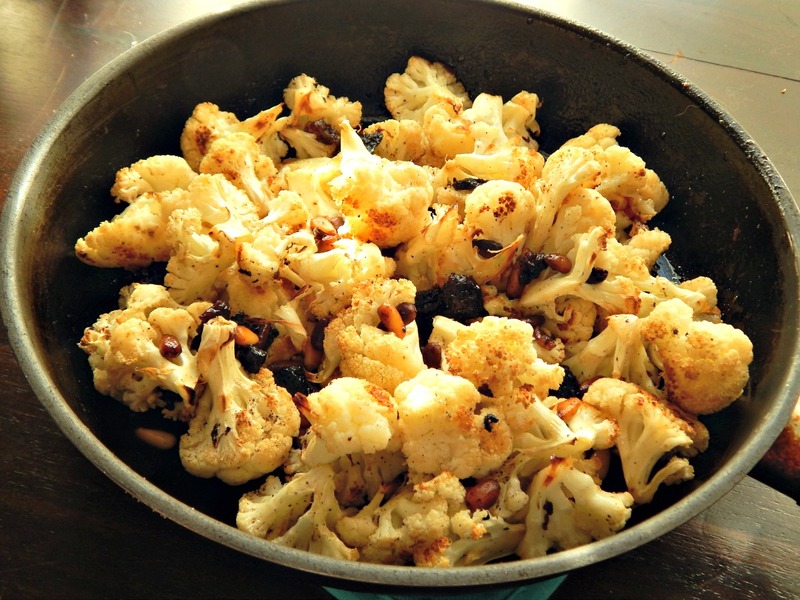 Those dates, pine nuts and brown butter were all perfect with the cauliflower. I made this dish to go with North African Meatballs and I can see it being a perfect side for so many African, Middle Eastern, Mediterranean or Spanish meals. Preferably using a light colored, large skillet, melt butter over medium heat. Add pine nuts and continue to cook, stirring, until pine nuts have picked up some color and butter is just starting to brown and smell nutty, two to three minutes. Remove from heat and toss in the garlic and dates. Stir, then add the roasted cauliflower and toss until coated. Serve from the pan or turn out into a serving dish. Note: The time above includes the time to prep and roast the cauliflower. This entry was posted in Click here for Fabulous Food Posts and tagged brown butter, Cauliflower, Dates, Dried Fruit, Nuts and Seeds, pine nuts, Vegetable Side. Bookmark the permalink. So interesting Mollie! just a touch of sweetness with the cauliflower– you are so inventive! –and we love pine nuts ( i buy the large size bags at Costco and keep them in the fridge– a little cheaper that way) fun recipe!! hugs friend! We have a membership, mostly because my Dad needed new glasses, so I’ll have to look for them next time. I feel I’ve barely scratched the surface of what’s available at Costco! It’s just SOOO huge! Oh I know me too I have my grandma’s date pinwheel recipe on here. I’m guessing it’s probably pretty close to how your mom made them. Is the garlic chopped? I am thinking yes, but didn’t want to assume. And thinking it needs a slight cook (maybe the hot butter is enough) to get the raw taste out. That’s my goal, but I fell off the wagon with a chocolate cheesecake! Coming soon, lol!! I never would have thought of adding dates to cauliflower but I’m sure they add lots of flavor to the dish. Very interesting! Love cauliflower in all the forms – I have to try this! I think you might like it so much you’ll be tempted to come up with a wine pairing. I was thinking Syrah…but there’s that thing that is kind of intimidating when talking with a wine expert! Like I would think Syrah but then be like but maybe not, lol! I must admit I have never bought a date in my life! I have had pastries with them in it at parties and such. Where do you find them? Are they jarred? OK by the raisins now makes perfectly good sense, lol! I just couldn’t wrap my head around where to find them in the store! Looks delicious! I would never think to put these flavors together but I bet it is great. Haven’t had dates in so long I cant remember. So I have to ask. Why use a light colored skillet? Thanks, and I should have mentioned why! So you can keep an eye on the color of the butter. Once it gets too dark, it just isn’t any good.